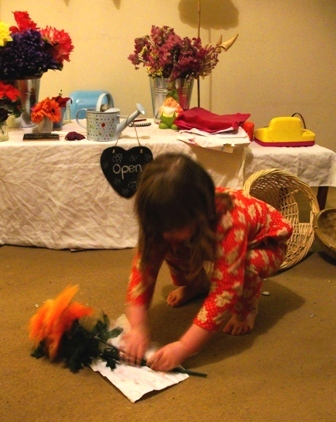 We love setting up play areas at home, in the past we've had a Shoe Shop, Bakers, Ice cream stand & Post Office. This time Minnie requested a Flower Shop! After a deep breath & a quick search around the house we came up with this - Daisy's Flower Shop! 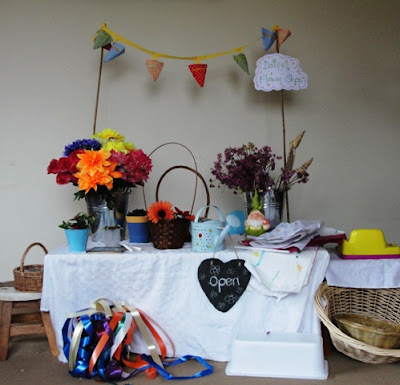 To create our Flower Shop we used a coffee table (covered with a white sheet), & 2 garden canes which we taped to the bottom of the table, & attached some coloured bunting to the top. 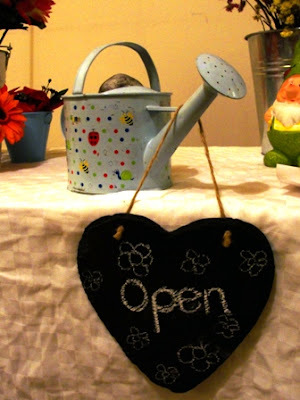 We also added a simple shop sign. 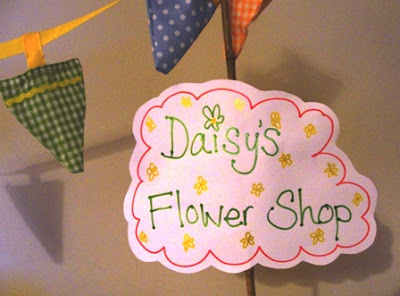 If Minnie hadn't been quite so eager for the flower shop to be open straight away I think she could have designed her own sign, but may be that's something she'll wish to create later. 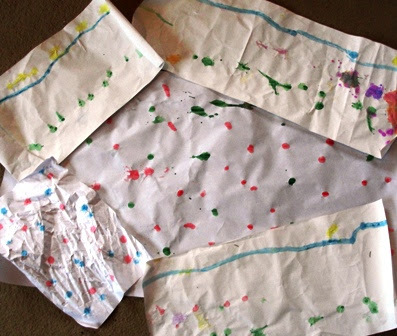 Minnie had recently been printing & painting on long strips of paper, & these colourful designs made great wrapping papers for the flowers. 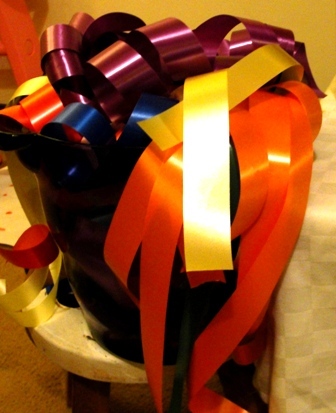 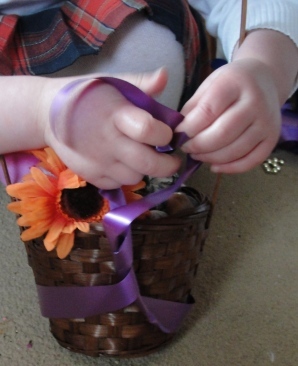 Along with these we added a bucket of different coloured ribbons, flower buckets, & a few smaller containers that Minnie could arrange the flowers in. 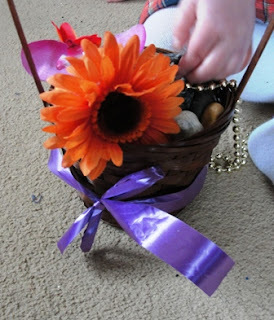 I added a selection of different sized baskets, & placed Plasticine in the base to enable Minnie to add flowers to if she wished. 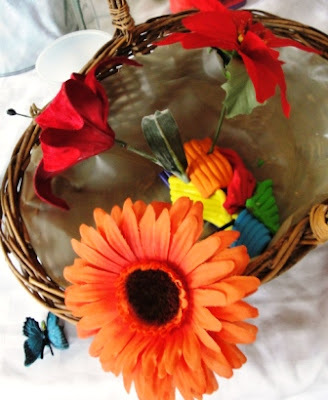 We used silk flowers (that we picked up from Poundland), a few dried flowers, & other foliage that we gathered from around the house. 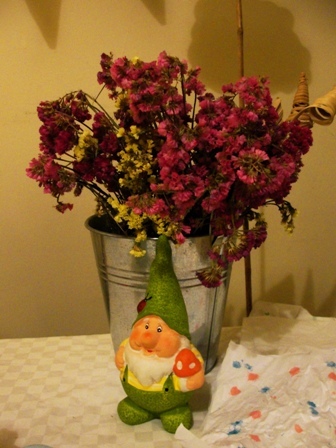 Minnie decided the shop needed a gnome too! 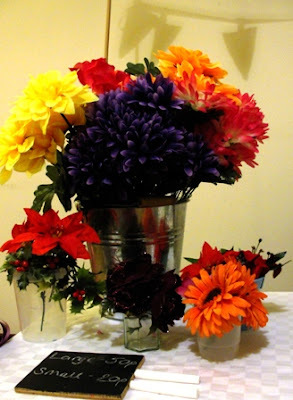 With the addition of a cash till, phone, & an open/closed sign the flower shop was open for business! 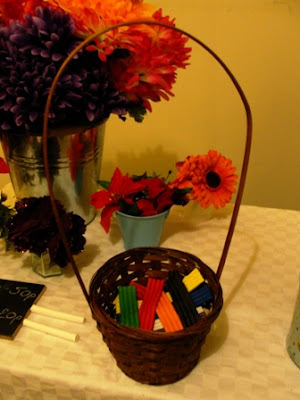 We added a notepad & pencils to jot down any important orders, & a couple of small chalkboards with chalk to price items. Minnie made copious notes, & wrote/designed all her receipts. 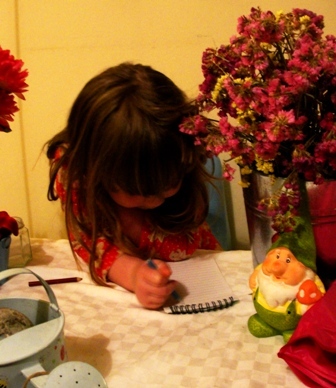 It was really useful to observe which letters/numbers she jotted down & listen to her conversation as she did so. 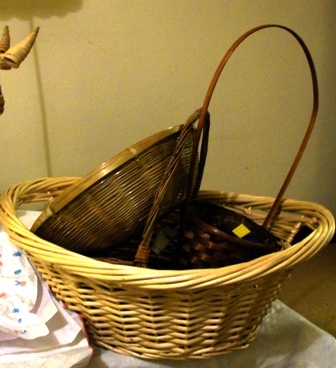 The basket arrangements proved a big hit, especially the ones containing the Plasticine. Flowers were pushed into the clay, & pebbles added to the arrangement, along with ribbons, & accessories! Wrapping the paper around the flowers enabled Minnie to explore size, shape, & length. 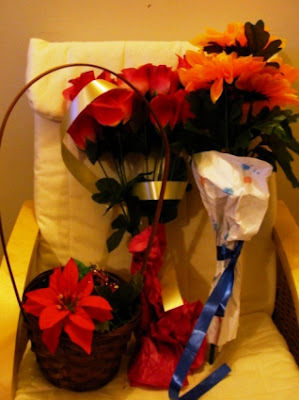 I received several bunches of wrapped flowers which was lovely, although I did have to pay £20 for one of them!! We used real money in the flower shop, which provided an opportunity to explore the shape, size & value of different coins. 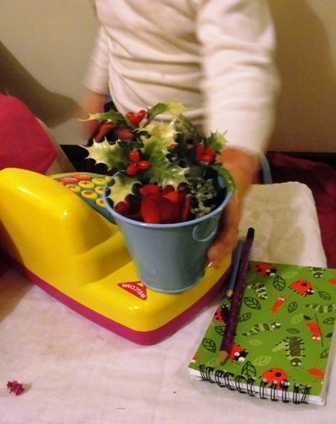 After each item had whizzed through the cash till, Minnie excitedly sorted money & organised receipts & change. 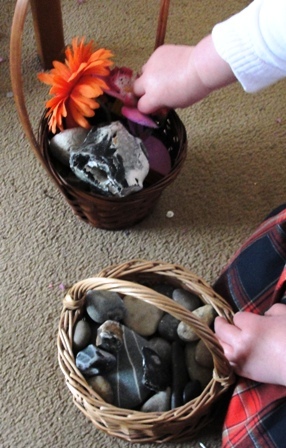 This play set up has encouraged much imaginative play, creativity, & new discoveries. Today Minnie independently added herbs from our garden to the flower shop adding a new sensory experience. I love how the play in this set up is constantly evolving, & how it's stimulating Minnie's creativity in so many ways.